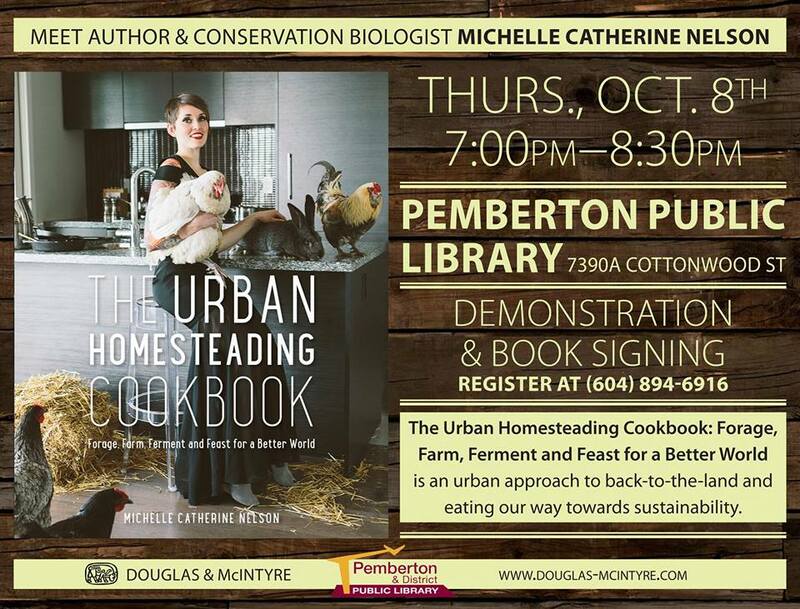 Ethical eating author Dr. Michelle Catherine Nelson will read from The Urban Homesteading Cookbook, her book about earthwise consumption, at the Pemberton Library on Thursday night. In the book, Nelson shares what she learned from her family history of backyard food production, her Ph.D. in conservation biology and sustainable agriculture, and a whole lot of trial and error. There are more than 80 recipes and photos offering an alternative to industrialized agriculture. Nelson aims to inspire people to consume in a way that is better for individual health, and for the animals and ecosystems that provide our food. The Urban Homesteading Cookbook also contains information on preserving food, foraging in urban areas, keeping micro livestock (including rabbits, quail, honeybees and crickets) and growing both plants and freshwater seafood in small spaces. Nelson makes the back-to-the-land movement possible, regardless of where you live.